What does an “Illegal Immigrant” look like in Arizona? Norway and Czech republic. But even the Coyotes team are dominated by Canadians with Czech, players easily outnumbering the lone 4 Americans…. this new Arizona law isn't about racial profiling, says their Governor. Bertuzzi could be detained to miss a hockey game. 9/11 a threat to homeland security and brought in more police powers. Hawaii and is not an illegal immigrant himself. This entry was posted in Main Page on April 24, 2010 by Todd. Memories of Chinatown's golden age and chef James Sam took place at Foo's Ho Ho Restaurant on Thursday, April 18th. owner of Foo's Ho Ho Restaurant. The Friends of Foo's Ho Ho ad-hoc committee has been gathering friends to raise the profile of Chinatown's last traditional Cantonese pioneer cuisine restaurant in Vancouver Chinatown. 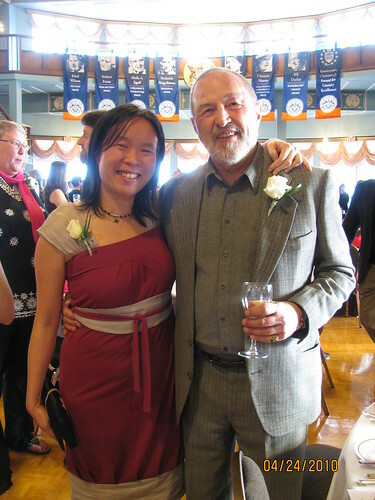 Jim Wong-Chu and Jacqueline Young have been spearheading the group which has been holding monthly dinners. This night's dinner was full of gaiety and celebration with 100 seats. Lively jazz vocal music greeted arriving guest courtesy of pianist Bob York and vocalis Phyllis. Wes Fung greeted people at the door. Emcee duties were performed by Todd Wong – me! Special guest speakers included Dr. Jan Walls – former director of SFU's David Lam Centre for International Communication, James Wright – general director of Vancouver Opera, and Jim Wong-Chu – community leader, who is spearheading this movement to revitalize and recognize the Foo's Ho Ho Restaurant and it's culinary importance to Vancouver Chinatown and BC history. Dr. Walls is renowned for his clapper tales – an ancient form of Chinese rhythmic poetry, similar to contemporary rapping. He was once invited by Yo Yo Ma to perform in Boston. Jan is always a favorite at Gung Haggis Fat Choy dinner events. Mr. Wright talked about how Vancouver Opera has built tremendous community outreach programs for their major productions such as Madama Butterfly and Nixon in China, as well as for Vancouver Opera Touring Ensembe's traveling productions of Naomi's Road. A power point display about Vancouver Chinatown with quotes of people talking about Chinatown and Foo's Ho Ho was created and presented by Ewin, Fanna and Larry. Karen Lee-Morlang performed songs by Gershwin and Jelly Roll Morton. I joined her for a short rendition of “As Time Goes By” as we lit sparklers on a cake for Sam's birthday anniversary. This entry was posted in Main Page on April 10, 2010 by Todd. 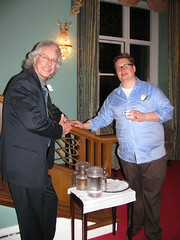 It was fun to host the 2010 BC Book Awards Soiree on Wednesday night. It is indeed one of my favorite events because I get to meet new writers, greet writer friends, buy some new books, pick up some great silent auction prizes… and the organizers are always so friendly! This time as host, it was much busier. Before going over the evening's script, the first thing I had to do was find my girlfriend Deb, to borrow her credit card to pay for the parking downstairs. At past events you could always put money into the meters for 2 hours, and not worry. But with extended meters until 10pm on busy Robson St. I don't take chances anymore. Event producer Fernanda Vivieros had the updated scripts ready, and I acquainted myself with the room and who was there. A good cross-section of BC's literary community of authors, publishers and organizers. 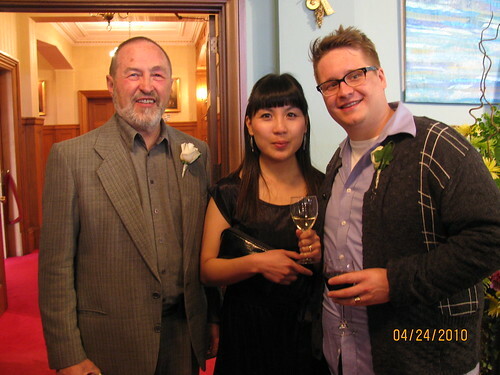 I said hello to publisher Scott McIntyre, organizer Linda Johnston, greeted author Larissa Lai who we featured at the Gung Haggis Fat Choy Dinner this year, and waved to David Chariandy – author of Soucouyant (2008 nominee). 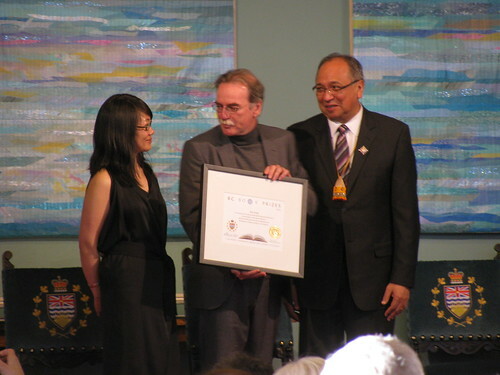 “We have chosen Stan Persky as the recipient of the 2010 Lieutenant Governor's Award for Literary Excellence because of the intellectual and moral integrity he brings to his work as a writer who engages with some of the most difficult questions facing society, and because of the great contributions he has made to the literary canon of Canada and British Columbia. His numerous books and his trial-blazing efforts in creating literary journals and a forum for public engagement – not least New Star Books and the Georgia Straight – have helped develop British Columbia's literary community into what it is today. And books! I always walk away with new books in my hands. This year I purchased Charles Demers' Vancouver Special, Spirit of the Nikkei Fleet: BC's Japanese Canadian Fishermen by Masako Fukawa with Stanley Fukawa, and Red by Michael Nicoll Yahgulanaas. And Larissa Lai also signed my copies of her nominated poetry collection Automaton Biographies. 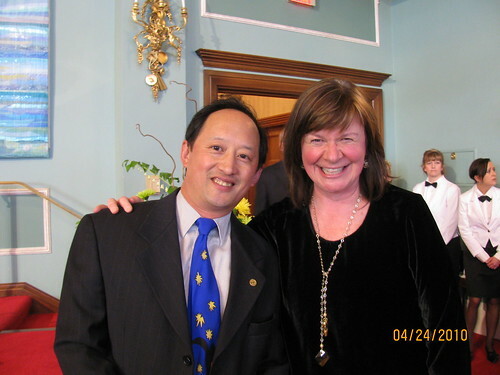 This entry was posted in Literary Events, Main Page, Todd Wong on April 8, 2010 by Todd. It's a busy week for great events. Tonight I am hosting the BC Book Awards Soiree at the Listel Hotel. I have read the script, and I am very happy that I get to announce the 2010 winner of the Lt. Gov. Excellence in Writing Award. The two previous winners were friends Gary Geddes, and Terry Glavin. I can only hint that I also know the 2010 winner…. somebody I've known for more than 20 years! 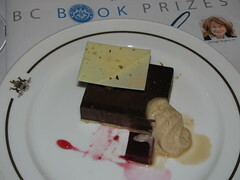 The BC Book Prizes Soiree is always a lot of fun. There are great silent auction and door prizes. You can purchase the nominated books, and ask the authors to sign them. Meanwhile… tomorrow night is the first Friends of Foo's Ho Ho fundraiser. The ad hoc group “Friends of Foo's Ho Ho have had a number of social dinners so far. But this one is a biggie that you don't want to miss. 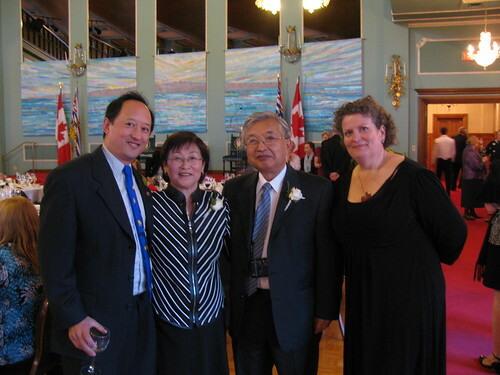 Special guest speakers include Dr. Jan Walls, James Wright (Vancouver Opera), Chuck Lew, Jim Wong-Chu. There will be special musical guests. Contact me if you would like to sit at my table. This entry was posted in Main Page on April 7, 2010 by Todd. better known as “Sam”, former chef and owner of Foo's Ho Ho Restaurant. restaurant. Please join the Friends of Foo's Ho Ho in this inaugural fundraising dinner. Cash bar. Thursday April 8th, 2010 at 6 pm – Foo's Ho Ho upper dining hall. Tickets $50/person – RSVP by April 7th, 2010. Please indicate if vegetarian options are required. excite you to partake in this once in a lifetime In the House show. are a maximum of 30 people per show so don't miss out!. Tickets and information on In the House are available on-line at http://www.facebook.com/l/a5db9;www.inthehousefestival.com. This entry was posted in Main Page on April 5, 2010 by Todd.